August was a busy month here at findmypast.com.au! Last month, the Australian office alone added 10 new data sets and over 2 million records to the findmypast.com.au collection (not to mention over 2.5 million records in Ireland, 315,000 in the UK and over 71,000 in the US), hosted our first speaking tour in two cities, and attended several events. 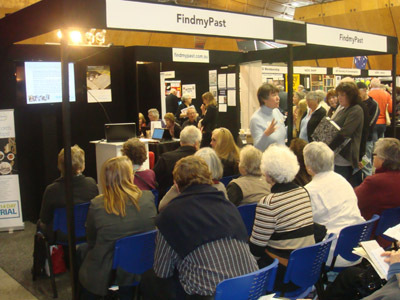 Our busiest month yet here at findmypast.com.au began across the Tasman, at the equally action-packed New Zealand Family History Fair. The Fair brought together genealogists, family history researchers, local historians and more from all across New Zealand for a weekend-long celebration of all things whakapapa and family history. Seminars, talks, and dozens of exhibitor stands - findmypast.com.au included! - made for an informative and lively weekend. Flags, kilts, posters, books, bonnets and even the music of a young Scottish piper added to the festive, historic atmosphere of our venue, Auckland’s Vodafone Events Centre. Unfortunately, this venue didn’t come without its technological challenges – somewhat ironically, the Vodafone Events Centre WiFi stubbornly refused to work all weekend. As you can imagine, this presented somewhat of a challenge for the findmypast team, having set up six laptops for visitors to peruse the records on our website. Fortunately, the portable internet connection we had brought along just in case helped us avoid a meltdown! Indeed, the whole team was kept very busy introducing visitors to the vast collection of records available on findmypast.com.au, familiarising them with our search, answering their questions – and even breaking down a brick wall or two down along the way. To our excitement, Joshua Taylor, Lead Genealogist of findmypast.com, came all the way from Los Angeles to deliver a back-to-back roster of seminars. So popular were Joshua’s talks, in fact, that we soon learnt to schedule our breaks around them; every staff member and volunteer had to be at hand for the crowds that flocked to our stand as soon as each of Joshua’s seminars concluded! Just as popular were the mini talks at the findmypast stall, presented by our amazing speaker, Sheryl Baron. Despite the lack of microphone, Sheryl did a fantastic job explaining how to access parish records, BDMs and British newspapers on findmypast.com.au. Her talks were a big hit, sending many researchers straight to the findmypast.com.au laptops to put their newfound insider tips into practice. A special mini talk was also delivered by Cassie Mercer, editor of Inside History, on the magazine and its potential to help break down brick walls. Her gorgeous magazines added a touch of historical glamour to the findmypast stall (though, eagerly snatched up by visitors, they didn’t last long!). Among the Fair’s highlights was its Friday morning session dedicated to school students. Energetic and enthusiastic, hordes of schoolkids attended talks, asked questions and explored the exhibitor stands. Some even pulled up a seat at our laptops and began their own research! Unsurprisingly, they had the hang of our search in no time and were soon excitedly exclaiming their discoveries. To our delight, several teachers and even students returned to the findmypast.com.au stall on the following days to continue their research. 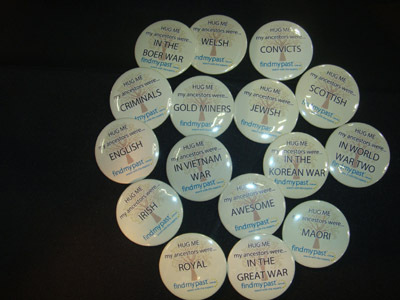 Overall, however, the students were most thrilled by our custom-made family history badges. And they weren’t the only ones! Our badges were immensely popular among all age groups, drawing visitors all weekend. For the record, the most popular option among schoolkids and family historians alike was the proud “My ancestor was awesome” badge, which soon became ubiquitous throughout the exhibition hall. The badges were a great conversation starter, sparking anecdotes about visitors’ illustrious and, well, not-so-illustrious ancestors. All weekend we were regaled with fascinating tales of pirates, soldiers, mayors, Maori royalty, farmers, bushrangers, pilots, Irish runaways… and many, many a convict. But the best thing about the Fair was undoubtedly the opportunity to meet New Zealand family historians, to learn whom and what they were researching, and help them on their search. We wish all the attendees luck with tracing their ancestors on findmypast.com.au – hopefully you will have many more stories to share and leads to trace at the next Family History Fair in 2015! In the meantime, findmypast.com.au is adding records and resources every month to help with your research. Search its extensive collections here. Finally, many thanks to the volunteers and helpers who helped us at findmypast.com.au – Sheryl Baron, Gloria White, Wendy Fitzpatrick, Pat Gibson, the Scottish Interest Group workers, and last but not least Jan Gow – for all your valued assistance and dedication, and of course to all volunteers and organisers of the New Zealand Family History Fair who made it such a tremendous success.